Sharp isn’t paying much heed to rumors that Apple is developing an HDTV. Nor does it have much reason to, says Kozo Takahashi, head of the company’s operations in North and South America. Of course, one might be reminded of the comment by Palm’s CEO before the Apple iPhone was introduced: “PC guys are not going to just figure [phones] out. They’re not going to just walk in.” Ouch! What we’re seeing is incumbents falling back on the thing that got them to their position: features. This is feature-led innovation. It’s got its place in the market, but relying only on it puts companies at risk for missing either (i) critical market shifts; or (ii) emerging needs that will drive organic growth. Meanwhile, customers cast about for ways of fulfilling their new jobs-to-be-done. They improvise. They settle. They experiment. They’re open to new entrants that meet their emerging jobs. And this is how it happens to companies. The first two of those jobs have emerged based on new technologies in other arenas (recommendation engines, social networks). The third is a tried-and-true job that’s been around forever. Might there be a play to improve that via my TV? All three of those jobs-to-be-done are divergent from the ongoing focus on picture quality espoused by the incumbent TV leaders. Wait a minute. Are you telling me that with all that megapixel firepower, we’re gravitating toward phone cameras? What’s wrong with people these days? I’m @bhc3 on Twitter, and I’m a Senior Consultant at HYPE Innovation. 28 Responses to It’s the Jobs-to-Be-Done, Stupid! Great points, Hutch – those under-served customers are always the biggest market imaginable, and by default, their needs are quite different from the early adopters/innovators. Let’s face it though – most companies aren’t good at listening. They don’t hear the complaints and seriously address them, when products fail at their stated purpose, and the far more subtle aspect of listening for unstated needs/wants? That’s like magic to most companies. It’s either a trick, or not possible, so why bother? Of course Sharp, Samsung, etc., in what they say publicly vs. what they are doing behind the scenes, are potentially just aiming to throw off signals that they aren’t worried, while their pants are on fire behind the scenes, OR… as you suggest, they are simply waiting around to continue business as usual. And the underserved grows over time, unless a company is agile in reading the market and adjusting. Takes some “out-of-body” experiences by the company…as in, get out of the office. Great write up Hutch.. ! So true, how we get in trap of expanding the product based on customer feedback and forget about the emerging markets. Thanks Hitashi. Customer feedback on current product is immediate, pulse-inducing and subject to “we gotta get this done now!” Getting away from that is one of the bigger challenges. Great post, Hutch – you make a very good point in separating needs (jobs-to-be-done) and solutions (features). I think it’s a crucial skill to be able to abstract from solutions to needs. Here is my take on why it’s crucial to distinguish solutions from needs – might be of interest in this context. It was quite interesting to see Lance Bettencourt from Strategyn agreeing to this point in the comments. Great stuff, Hutch. You’ve got the crystal ball fired up. I have only one thing to add and I’ll zero in on the remote control device aspect of HDTV’s. If Apple can make the remote disappear from the face of the earth, leaving the iPhone in its place, I will worship them for eternity. Here’s a quote from the Steve Jobs bio by Isaacson re: how Apple came to create the iPhone after the debacle with the ROKR with Motorola, Apple and Cingular. In my humble opinion, the remote is Byzantine as well. Thanks! Jobs had Jobs-to-be-done. So true. Thanks Brian. And it is amazing how similar remote controls are to the old, pre-iPhone mobile phones. Lots and lots of excess keys and functions. Definitely needs some iPhone-ization. Hi Hutch, in case you’re interested, I just started reading Adam Lashinsky’s “Inside Apple” that came out in January of this year re: the Apple culture. Fascinating stuff. Very nice write up on 1) jobs diverging over time and 2) the traps of feature-led innovation and 3) clear examples of how incumbents have had their focus on the wrong jobs at the wrong time (both yesterday with Palm and today with incumbent HDTV leaders). Well done. Yeah, that first one, that jobs diverge over time. It strikes me as the root cause of so many companies’ going under. hey need a mix of increased awareness of changes, and an institutional willingness to do something about it. 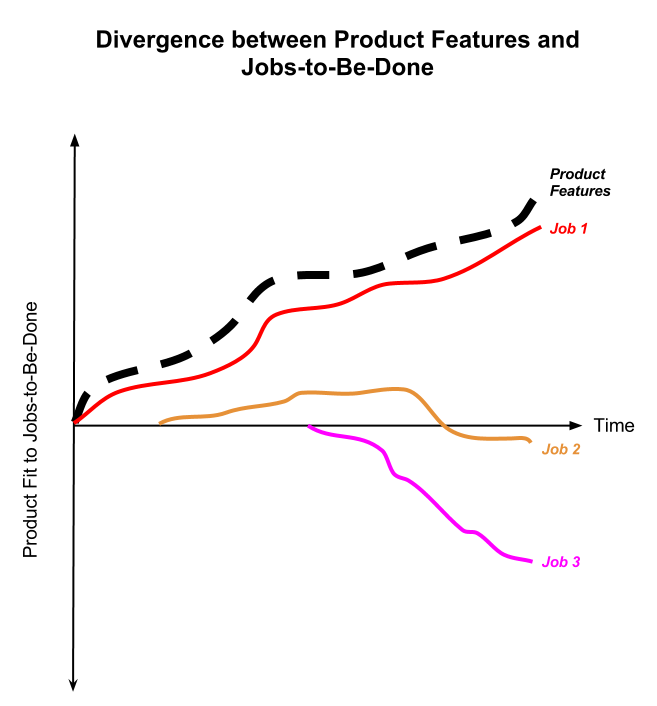 Hi Hutch and Alec, I think one part of the dynamic of jobs diverging over time relates to the consumer’s changing expectations of quality/product dimensions. We use the Kano Model a lot to help explain how “wow” features migrate over time to “expected” features. Please help me understand what those “needs” are? I am about to launch a new product and want to thoroughly recognize and appreciate what the the needs of my target audiences might be. Hutch: You wrote: I’m not sure what the difference is between a job 2 or 3 and a new feature. Doesn’t completing or responding to job 2 or 3 result in a new feature? I’m not sure what the difference is between a job 2 or 3 and a new feature. Doesn’t completing or responding to job 2 or 3 result in a new feature? Job 2, 3 are new needs that people have. “Needs” might be overstating it, perhaps one could say they are things people want to. For example. People have taken to sharing their thoughts and reading those of others during TV sports events and popular programs (e.g. American Idol). My job is to be able to share those moments. Now, I can just write a tweet. But would if I could click a point in time of the program, make that a link and use that my tweet or Facebook post. Now, when your focus is only on picture quality, you’re *not* thinking about this new job-to-be-done. Sure, the manifestation of the job is a feature. But the feature only gets there by knowing the job I want to get done. 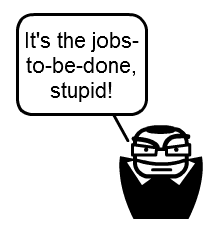 Hutch – I really like your concept of “Jobs-to-be-done” as a metaphor for understanding customer/consumer requirements. This seems such a no-brainer, yet companies consistently seem to stagnate and pay more attention to what they’re doing than what they could be doing. In the process, their (shall we call them) crowd-sourced design team is completely ignored. It seems they go on the defensive, scrambling to fix their shortcomings rather than working collaboratively to design a way beyond them. I guess this is just another job-to-be-done wrt the use of social media to truly communicate with, rather than react to and direct, consumers. It’s so prevalent, I don’t think it’s a case of specific personality types attracted to product/strategy jobs who are extremely tone-deaf. Rather, it’s deeply ingrained into the process itself. Everything is about the success you’re having, not the changes that are happening. This post reminds me of the Total Experience Model which I developed last year and presented at SXSW and use in my day to day as a product manager. The job to be done is similar to what i called “activity needs”. it also goes one level higher though, to life needs. check out a blog post I wrote on the topic. the book referred to there has more detailed as well.